Sam Slockbower is currently completing a BFA in Horn Performance under William Caballero at Carnegie Mellon University. While in high school she performed in New Jersey’s County, Regional, and State festivals. She was also invited to perform Mahler’s First Symphony with the New Jersey Youth Symphony at Carnegie Hall. She also performed regularly with the New Jersey Wind Symphony. She spent two summers touring Europe with the American Music Abroad festival and represented American musicianship through weekly concerts. She has experience playing in both brass quintets and wind quintets. In her Freshman year her chamber group won the Carnegie Mellon Rembacher Competition for innovative chamber music. Her brass ensemble played pre-shows for the Pittsburgh Symphony Orchestra and was awarded the Honorable Mention in the Pittsburgh Chamber Society’s Major Winner Competition. 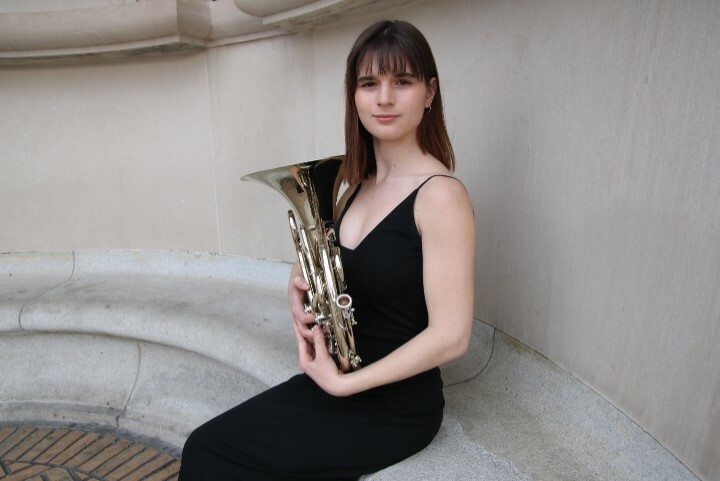 She regularly performs in the Carnegie Mellon Wind Ensemble, the Carnegie Mellon Brass Ensemble, and the Carnegie Mellon Philharmonic and has held principal positions in all of these ensembles. She was also hired to play as a guest artist with Carnegie Mellon’s All University Orchestra and performed with the Pittsburgh Youth Symphony as principal and third horn. She has attended master classes with Mark Houghton, Robert Lauver, and Javier Bonet.